Very often when we visit a website, we are presented with a list of choices for us to select. 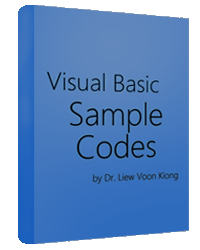 Choice selection can easily be programmed in Visual Basic using check box. The status of the check box is either checked or unchecked, and the syntax is Checkbox1.Value=VbChecked or Checkbox1.Value=Unchecked. In the following program , we construct a three-choice selection list. After making a selection, a message box displaying the list of selected choices will appear .